In a recent New York Times article, Klobuchar was described as once eating a salad with a comb after being stuck on a plane without a fork. She went after another elephant in the room by addressing media reports claiming she often berated her staff. “So when Jerry called me about tonight, he asked, ‘Do you need a microphone or do you just prefer to yell at everyone? '” she said. “I said microphone,” Klobuchar deadpanned. Klobuchar was invited to address the annual white-tie, invitation-only affair hosted by Washington’s journalism establishment, along with her Republican colleague, Sen. John Kennedy of Louisiana. A relative newcomer to the Congress, Kennedy’s folksy, quick-witted sound bites have garnered attention. In a town known for its backbiting politics rather than its humor, Washington provides only a few occasions for politicians to roast their colleagues and themselves. Klobuchar, like many before her, used the unique platform to poke fun at herself and take on her critics. Traditionally, the President of the United States addresses the group. 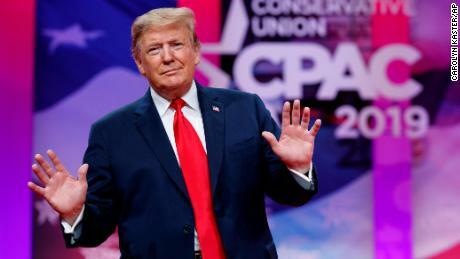 Last year, President Donald Trump delivered punchlines for nearly 30 minutes by going after his own administration, family members, Democrats and the media. It was Trump’s only appearance in three Gridiron dinners since he became President. In his place, Trump sent his daughter and White House senior adviser Ivanka Trump. She openly pondered how her father, fresh off a more than two-hour long speech at CPAC earlier in the day, could pass up an opportunity to make fun of journalists. On her campaign announcement during a snowstorm: “As you all know, I am now officially running for President of the United States. You probably saw my announcement in my permanent snow globe. And yes, I’m the first candidate whose motorcade was led by a Zamboni. CNN’s Paul LeBlanc contributed to this report.